There are strange, repeating, symbols built into the buildings and public places all around Reading. 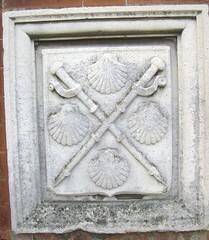 There are 4 scallops and 2 crossed pilgrim staff’s on the gate posts of Palmers park. 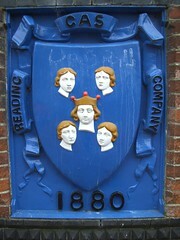 The Scallops turn up again in the Univerity of Reading’s coat of arms. Evidently the shells are thought to be an emblem of pilgramage because pilgrims to Europe would bring back the scallop shells from beaches. The association with Reading is probably because the old Abbey claimed to hold the hand of St James as a holy relic that shell-carrying pilgrims would come to visit. I wonder how St. James hand got to Reading Abbey…. Scallop or i-pod? visit your nana or some dead saints embalmed hand? Such choices open to the modern traveller. Four miserable looking people surrounding a chap in a crown on a bridge over the river kennet. This same symbol also appears on one of the gate-posts of Palmer’s park, though in not as much full delightful pale-skinned, blonde and blue colouring. Aparantly this is Reading Town’s coat of Arms and the 4 people are probably burgesses… ..and the miserable looking person is Queen Elizabeth (1 or 2 depending on how you feel). A version of this cluster of people turns up on the symbol for ‘Reading School’ the people have an almost ominous range of sly through snide to surreal expressions. Girl power gone wonkey? This scribble was published on Wednesday, April 23rd, 2008. You can follow any banter on this scribble with the RSS 2.0 feed. You can share your inspired musings after typing the anti spam word near the bottom of the page. But no Pinging because its too naughty. All I remember is that there is (or was) a pub called the “Five Merry Maidens(sic)” – which was also the basis of the town coat of arms. Come on local historians, give us an erudite opinion! describes the central woman as 10th century Queen Aelfthrith and the surrounding 4 as nuns from a Royal nunnary she founded reputedly as repentance for having murdered her 16yr old step-son, Witan elected King Eadweard, posthumously ‘St Edward the Martyr’, Saints day = 18th March.